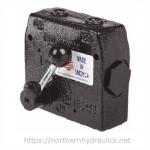 At Northern Hydraulics we stock a complete line of hydraulic flow control valves along with valve replacement parts by Cross Manufacturing, Prince Hydraulics, and Energy Manufacturing (Williams Machine and Tool). Do you need to replace the control valve on your tractor or wood splitter? 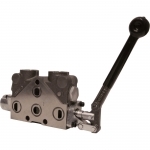 We have single, double and triple spool valves available from a variety of manufacturers. Joystick, handle, cable and air operated actuators are available in many configurations. We are able to meet the needs of open and closed center systems. Closed center and flow control upgrades are available. Give us a call at 1-800-823-4937 and we will be happy to assist you in finding the right hydraulic control valves to meet your needs.